Potato blight - It can be devastating. Planting those little seed potatoes, waiting on the first signs of growth, covering with soil…watering….waiting…watering...waiting. The time comes that you can let the foliage grow tall and flower then….BAM the leaves turn brown and it all starts to go downhill! Time and effort goes into growing any plant and when it is affected by a disease it can often be too late to save. 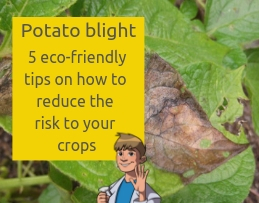 What are the signs of potato blight? What to do if your potatoes have been infected? Potato blight, late blight or Phytophthora infestans is a water mould that affects potatoes and tomatoes. It shows itself in the foliage of the plants extending down the growing potatoes over time. The disease can happen at any point however it spreads rapidly in warm and humid conditions. How do I know if my crops have blight? Potato blight appears on the leaves (and sometimes the stems) of your crops initially as dark marks or lesions, quickly turning brown in a matter of days. What do I do if my potatoes have blight? Where it looks as though only some of the leaves have been infected, trim these off. Once done make sure you safely disinfect your snips to stop spreading the infection further. If more than a 10th of the foliage is infected then it is likely that your whole potato plant is affected. Cut the foliage to ground level and harvest the potatoes for immediate use. Going forward into your next tatty season, you don’t want to have to go through this again do you? We know that it is extremely important for growers to move towards using products that are as environmentally friendly as possible. Eco-friendly garden cleaners are needed to stop the spread of disease before the plants have even been potted. Cleaning and maintaining your tools regularly will not only preserve them but it will also ensure that possible fungus and disease from infected crops are not passed on to new growth. There is an abundance of choice when it comes to choosing where to buy seed potatoes; rumour has it that Scottish seed potatoes are very popular due to the cooler climate which limits fungal disease, such as blight and discourages disease spreading aphids. Not sure if you want to plant Red Duke of York or King Edward? Eco-friendly anti-fungal sprays are hard to come by; the majority of products we found contain harmful chemicals which can have a negative effect on plants, animals and the environment. Disclaimer: Having not tried this homemade remedy we cannot vouch for its effectiveness however customer reviews speak for themselves. Blight is more prevalent in warm moist conditions so when watering, do it in the morning so any excess water soon evaporates. 5 – Mulch your crops – what is mulching? Mulching your crops will lock in moisture and will take longer for any blight spores to reach the potato tubers below. Mulching is a process whereby the growing plants are covered up during the growing process, usually with straw, hay or earth to exclude light from the growing potatoes. We love a fungus problem; fungus, bacteria and viruses are our favourite thing to talk about because we know that there are safe, sustainable ways to deal with these problems. Whether you are reading this in time to start your earlies or are getting ready to harvest a buddle of tatties for autumn, these tips will serve you well in fighting any blight problems you might have in the future. Do you have any other tips you would like to share with us? Maybe you have an eco-friendly solution to potato blight?